PORT WALK — HIKE - SNORKEL - DISCOVER - RELAX - REPEAT - St. Thomas port walking tour and private guide service. Take a step on a global pathway, view the islands past and present with an interpretive guide. Composed of diverse people and elements from around the globe, St. Thomas is welcoming you ashore. From the moment you catch glimpse of this tiny palm fringed island, outlined with a brilliant azure Caribbean Sea, your mind will be captivated by the islands natural beauty. Walk with us to uncover your island connection. Meeting your tour guide at the recognizable United States Postal Office building located just steps away from your ships concourse is where the two hours begin. Accompany your professional guide along the waters-edge walkway, interacting with the sea gulls and pelicans soliciting attention. The narrow streets of Charlotte Amalie will quickly transform you back into an era of rich history. Enthralled in royal Danish architecture, strikingly outlined in contrast with the blue Caribbean sky, you will make your way down the narrow “gades” (Danish term for “street” pronounced gah-dah). If so inclined (pun intended) accept the challenge of “99 Steps” (actually 103) leading you to one of five National Historic Landmarks in the islands, Bluebeard’s Castle. 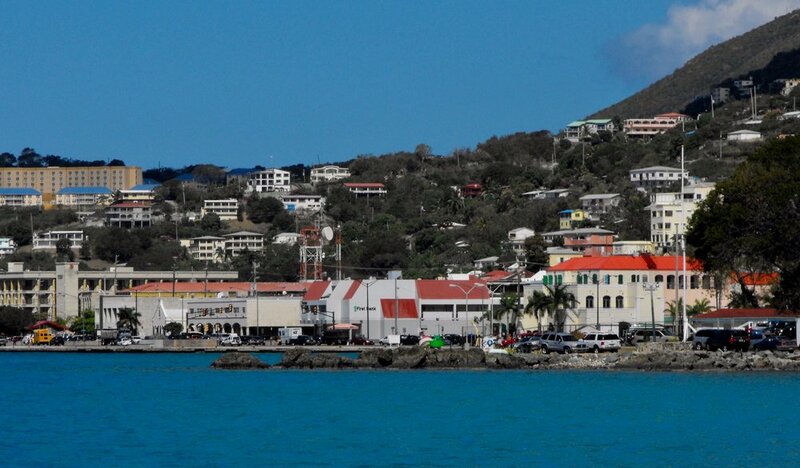 Take in a captivating view high above Charlotte Amalie Harbor before returning to your cruise line. Once you experience this cosmopolitan town you will find it difficult not to extend your stay with independent duty free shopping, lunch, art galleries, or just a little liquid sunshine. Remain in town independently or return with your guide on foot, back to the cruise port. Either way your guide is well versed and would be happy to share their recommendations and local favorites. Slide on a sturdy pair of walking shoes, slap on some sunscreen, lets help save the planet and walk for health, fitness, and sustainability. *Wheelchair accessible - streets remain uneven due to hurricane damages. *Crown Bay guests, please meet at the Havensight location. Approximate taxi rate is $5.